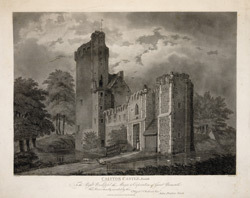 View of the ruins of Caistor Castle in Norfolk. This 15th-century 'castle' was built for a prominent aristocratic family, the Falstophs. In this impressive residence there were 26 rooms. The brick castle also had several defensive features: a moat; outer and inner courtyards; rounded towers; arrow slits and, later, gunports. It was successfully besieged by the Duke of Norfolk in 1469, and passed to the Paston family who occupied it for the next century.